NYSPA is proud to report that Governor Andrew M. Cuomo has announced the appointment of Ann M. Sullivan, MD as Acting Commissioner of the New York State Office of Mental Health (OMH) in November 2013. The Governor intends to nominate Dr. Sullivan for Commissioner during the next legislative session, with the nomination subject to confirmation by the New York State Senate. "Throughout her career, Dr. Sullivan has dedicated herself to protecting and preserving the health of all New Yorkers," said Governor Cuomo. "Her experience at Elmhurst and Queens Hospital Centers, which serves two million New Yorkers, will allow the OMH to excel under her leadership and guidance. I look forward to her continued work in our administration." "I would like to thank Governor Cuomo for this opportunity to serve as Acting Commissioner of Mental Health and to work to provide quality mental health services for all New Yorkers," said Dr. Sullivan. "I look forward to the new direction set by the Medicaid Redesign Team and especially the focus on integrated care and real recovery from mental illness." Dr. Sullivan has been an active member of NYSPA and the National APA, having been the Treasurer of NYSPA and the Past Speaker of the APA Assembly. "Working with so many colleagues in NYSPA and National APA has taught me a great deal and helped me know the needs of our patients. I look forward to continuing to work with all of you when I take on my new role in November." Dr. Sullivan has enjoyed an extensive career in the public sector. Prior to her current position as the Senior Vice President for the Queens Health Network she was the Director of Psychiatry at Elmhurst Hospital in Queens. She also served as the Medical Director of Ambulatory Care Services at Gouverneur Health Services Diagnostic and Treatment Center and was an Attending Psychiatrist at Bellevue Hospital Center. Dr. Sullivan received her medical degree from the New York University School of Medicine. 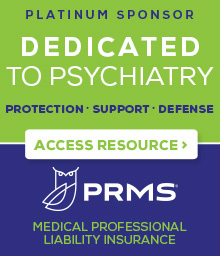 She is Board Certified and a Clinical Professor of Psychiatry at Mount Sinai School of Medicine. She is a member of the American College of Psychiatrists, a Fellow of the NY Academy of Medicine and on the Board of Directors of the Mental Health Association of New York City.